TLS signed “W. McKinley,” one page, 5.25 x 8.25, personal letterhead, June 29, 1896. 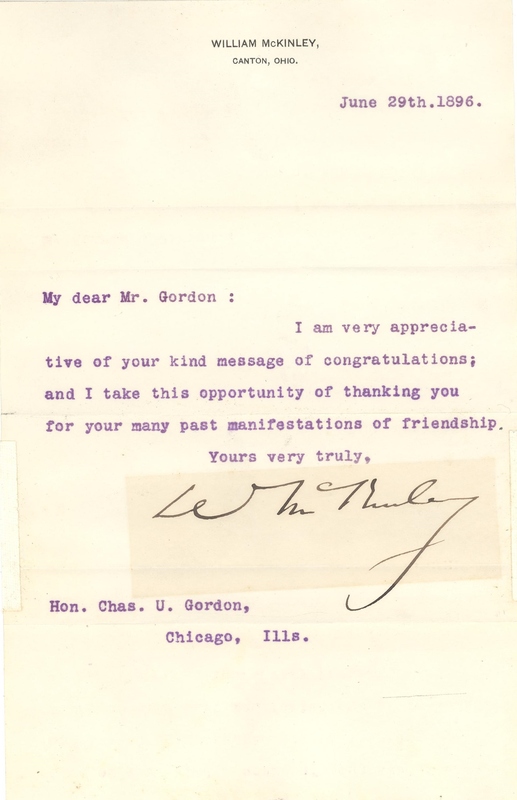 Letter to Charles U. Gordon, Chicago Ills., in full: " I am very appreciative of your kind message of congratulations; and I take the opportunity to thanking you for your manifestation of Friendship. Yours Very Truly “W. McKinley ." In fine condition, with a few small areas of old adhesive and toning where once matted around the signature. Accompanied by a portrait Engraving. McKinley had received the Republican nomination for president only eleven days earlier at the 1896 Republican National Convention in St. Louis.